Hello Everyone! Today I have a nautical card to share with you featuring Captain Owen From The July new release. I wanted to create a "Porthole" look to frame out Owen, I thought it would be s cute nod to the nautical theme. All the papers are from various sea themed paper pads, all of the patterned papers are sewed around the edges and distressed. The anchor is from Spellbinders, and the sentiment is from Some Odd Girl, unfortunately it is retired. Thank you so much for popping by today. I love this little beauty. She looks to thoughtful and peaceful. I used CC Designs stamps and dies, Wild Orchid Crafts flowers and designer papers to create this card. Thank you for popping by today, links to the CC Designs products I used will be below. Today I have a card to show you featuring "Super Hero Henry" from the July release plus some of the fantastic new dies as well. I absolutely adore this stamp! He is so cute! Thank you so much for popping by today! Have a wonderful day! Christmas in July with The PaperNest Dolls! Hello everyone! Its Christmas in July time! I am sharing one of the adorable new Christmas images from The Paper Nest Dolls With you today! I have never been one for "traditional" Christmas colors, so true to my self I did Red and Aqua! I used some older Christmas paper from my Minds Eye, a lot of the Dies are from My Creative Time and Spellbinders, all the flowers are from Wild Orchid Crafts. Isnt she the cutest? I used dies from the Magnolia Doohickey "Celebration" , as well as stamps and dies from My Creative Time. The Paper Nest Dolls New Release! Hello everyone are you ready for another fantastic new release from The Paper Nest Dolls?! You will not be disappointed! This is one of my Fave releases (Who am I kidding! I love the all!). For my First card I used "Strolling With Teddy"
I just love her! She is super cute. Ellie was colored with Copic Markers. I used Maja designs paper, La-La land crafts dies and flowers from Wild Orchid Crafts. For my next new release project I used "Superstar Ellie"
I kept this card CAS(at least as much as I'm capable of!) . One of the elements of the card is the little shaker I created with the star, I love putting elements of the card as a shaker instead of the whole card being a shaker occasionally. I hope you love the new release as much as I do! You can pick them both up here. Hello everyone! For my American friends Happy 4th! I hope you have a wonderful day!! Today I have a card featuring Marci from La-La Land Crafts, this Marci is from the June La-La Land Crafts Club Kit. This card also features several La-La Land Crafts dies. I created the shape of the card in Silhouette Studio. The designer payers are a mix of DoveCrafts "Paris" and Maja "Autumn Basics". All the flowers and all the pearl accents are from Wild Orchid Crafts. 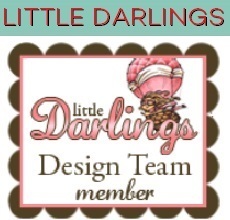 The only die that isn't La-La land crafts is the tag which is from CC Designs. Thank you so much for popping by and have a wonderful weekend! All the links will be below. Hello everybody! TGIF! So today I made a cute tag for using the new Pollycraft image called "Flash" from CC Designs. I also used the new "Super Duper Sentiments", "Make a Card #7" and the new "Make a tag #6" all of these are available in the CC Designs store now! There will be links below. Hello everyone! Today is New Release day for Cc Designs! You can find the entire release Here today at noon Est! For my card I created an adorable Shaker card using the new "Starla", the new sentiment set called "Super Sentiments", and the new "Make a Card #7" die set. Cc Designs Sneak Peek day! I made an adorable little gift bag with Lucy, The paper collection I used is "Secret Garden" from Kaiser Craft. The sentiment is a die cut piece from the same collection. The flowers are from Wild Orchid Crafts. The Coral and tan Ribbon and the metal rimmed pearl is from Stampin Up! Thank so much for looking everyone and have a Wonderful day!